Several software programs are available: - GeocachingCE PC module: loading caches into the database (for a fee); To use the PC software, follow the installation instructions and request an activation key (see Prices page) - GeocachingCE Wince module : FREE; To use the WINCE software, unzip the contents of the file into a directory on your SD card, or from the flash memory of your GPS. For example: "/SDMMC/GeocachingCE", and launch the executable. - NEW: Tiles Manager (FREE); Allows the management of tiles loaded with Mobile Atlas Creator Another software is available on request: - PocketGPSe : NMEA frame decoding utility -> allows you to check / test the correct operation of your GPS To use the software, unzip the contents of the file into a directory on your SD card, or from the flash memory of your GPS. For example: "/SDMMC/PocketGPSe", and run the executable. WINCE and PC programs do not require any pre-installation. 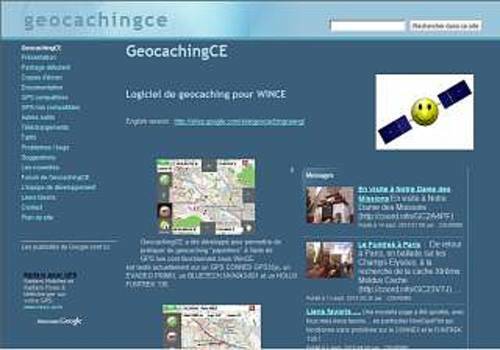 The CE software is provided with a database of 500 caches around Cergy (95).